Shown with optional banco (bench). Nichos (niches) and bancos available for all models. One of our more dynamic styles is the "Hopi", shown here with an optional banco. 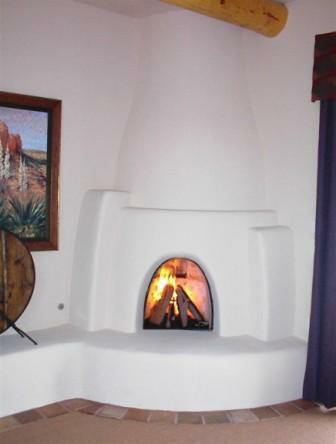 The varying terraces of the "Hopi" will add true Southwestern warmth into any home. This design is larger in size, stature and style. The hand laid firebrick in the firebox highlights the authentic styling of the fireplace which will burn either wood or gas logs. Optional bancos may be add to either side, along with nichos on the top. The frames may be extended or lowered to accommodate various ceiling heights.